Pet owners know that homemade dog food can be a great nutritional choice for their canines when done right. If done incorrectly, however, it can also be a devastating decision that costs your dog his health. Let's talk about all the pros and cons of homemade dog food recipes. What homemade dog food diets exist? 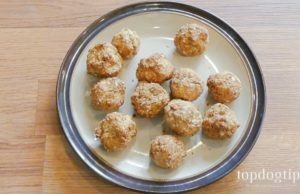 Before we get into the pros and cons of the homemade dog food recipes and their accompanying diets, and discuss some of the myths and facts, let's talk about what a homemade dog food diet actually is. If you're looking for recipes, there's plenty of them right here. Homemade dog food is a term used for food that is cooked for dogs at home using the same ingredients that we use in our own diets (i.e. human foods). Dogs that are fed a homemade dog food diet can avoid eating processed commercial dog food diets like dry kibble, dehydrated dog foods or canned wet dog food. With so much controversy surrounding the pet food industry, it's no wonder that more and more pet owners are shying away from commercial dog food brands and switching to using homemade dog food recipes to feed their canines a healthy meal. There are three popular ways to go about feeding a pet homemade dog food diet. The most popular homemade diets for dogs are so-called “raw diets” where the focus is on providing unprocessed raw meats and, depending on the diet, fruits and veggies. 1. The BARF diet – based on “ancestral” diet and the idea that dogs are omnivores, it's focused on unprocessed and “biologically appropriate” foods for dogs. Those include meat, bones, organs, fruits, vegetables and supplements. 2. The Prey Model Raw (PMR) diet – the PMR diet is animal-exclusive, and attempts to emulate what dogs would eat in the wild (what wolves eat) – whole prey. It includes meat, bones, organs, feathers, etc. There are no fruits or vegetables. 3. The DIY homemade dog food diet – a whatever works type of diet, where no specific rules apply other than whatever works for the dog and provides the nutrition needed without inclusion or exclusion of specific foods. Unlike the raw models, it can include both cooked and uncooked foods, and supplements. When nutritionally balanced and well-varied, homemade dog food recipes can be exceptionally beneficial for many reasons. Health issues like kidney, liver and heart disease can all be managed through veterinary care and a properly selected homemade dog food diet. Homemade food has proposed benefits for puppies, adult dogs and seniors. Pet food recalls are quite prevalent these days, which makes dog owners worry about the quality and safety of dog foods they feed their canines. Making homemade dog food for your pet allows you to regulate what foods go into his diet, much more so than going with commercial dog food brands. I am not only talking about meat versus byproduct, but also which cuts of meat, where that meat came from and the quality of the meat overall. Commercial pet foods bulk up their products with cheap filler ingredients that lack nutritional value. This allows for the creation of large amounts of food for a reduced cost. Ingredients that are not nutritionally valuable, however, tend to pass through your dog’s system and create more waste. It is also worth noting that filler ingredients in dog foods are often allergy-causing ingredients. Homemade dog food recipes allow you to optimize the nutritional value of the food you're feeding and eliminate unnecessary fillers and potential allergens. Feeding a commercial dog food diet often results in feeding the same variety of kibble for at least a month at a time (think one 30 lb bag of kibble). This lack of variation is boring for your dog, but it is also limiting in terms of nutritional value. Homemade dog food recipes allow you to regularly vary the ingredients of your pup's meals to offer a wider range of nutrients. Just like us, the more varied the nutrients your dog receives from their diet, the healthier they will be. Despite ingredient labels offering up information, commercial dog foods are often quite cryptic in terms of specifics (for example, “meat byproduct”). This leaves you feeding your dog mysterious ingredients or in the very least, artificial ingredients. Choosing to feed homemade dog food recipes allows you to incorporate more whole foods and healthy ingredients into Fido's diet. Additionally, you can avoid feeding your dog questionable ingredients like by-products. Where even the best quality commercial dog foods incorporate artificial preservatives and added salts to keep them fresh, homemade dog food does not. These preservatives can exacerbate existing health conditions, like heart disease, as well as contribute to general poor health. Just as it is better for humans to eat fewer preservatives and more fresh food, it is healthier for dogs as well. Home cooking dog food allows you the opportunity to use dog-friendly leftovers from human meals. This means less waste and less cost for your household. You can plan your families meals – both human and canine – ahead of time and save money by buying protein sources, fruits and vegetables in bulk. Some prescription dog foods or unique in their nutritional composition and require high manufacturing costs, such as protein based dog foods. Thus, they are often extremely expensive for owners. When dogs have allergies, it is not always enough to simply choose a dog food without that allergen in it. It is possible that a dog food can be exposed to that allergen during manufacturing or contain another variant of that allergen, such as chicken fat versus chicken. When making home cooked dog food, you can control exactly what ingredients go into your pet's food and eliminate any trace of allergens. You can work with your veterinarian or a canine nutritionist to eliminate the allergens in homemade dog food recipes and substitute healthy alternatives. There are plenty of great benefits to feeding a homemade dog food diet, but is it all good? Unfortunately, it's not. There are a few drawbacks to cooking homemade pet food. It is crucial, when making homemade dog food, that the correct supplements and vitamins are added to create optimal nutrition for your dog. 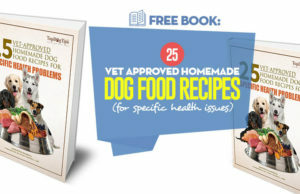 Many writers of homemade dog food recipes are not aware of these unique dietary needs and fail to incorporate the necessary supplements and vitamins. This results in health concerns, weight loss, and decreased energy. To ensure that a dog food recipe is nutritionally rounded, always choose a recipe book that has been formulated or overseen by a canine nutritionist or veterinarian. Most dog owners are aware that there are certain human foods that are unsafe for dogs (chocolate, onions, raisins, grapes, etc.) Unfortunately, not all dog owners or authors of homemade dog food recipes are aware of all of these unsafe ingredients. The best way to avoid cooking a dog food recipe that includes one of these foods is to utilize recipes formulated or overseen by a canine nutritionist or veterinarian. Additionally, familiarize yourself with the complete list of unsafe human foods for dogs. Dog owners who feed commercially prepared dog foods simply read the back of their dog food bag and know roughly how much food their dog needs per day. Following homemade dog food recipes means you're not provided with such concise nutritional information. It is this lack of nutritional information that often results in underfeeding dogs or overfeeding dogs when beginning a homemade dog food diet. This can be avoided by selecting homemade dog food recipes that do provide nutritional information or by calculating this information yourself with precision. Perhaps the biggest drawback to homemade dog food recipes is cost. Unlike commercial dog foods which can be quite affordable, homemade dog food relies on more costly ingredients. You can sometimes still find good quality homemade dog food recipes and stick to a reasonable budget if you really want to. Base your homemade dog food recipes on what you are eating for dinner that night and simply buy more and ration appropriately. Unlike commercial dog food, following homemade dog food recipes requires a considerable time commitment. Instead of simply scooping food into your dog’s bowl, you must measure, cook, portion, and store your dog’s food routinely. It's a chore. Homemade dog food can be time-consuming, but cooking in bulk and freezing your dog's food for later can help to reduce your overall time in the kitchen. While humans have plenty of choices for eating when they are traveling, dogs do not. Home cooking dog food is simply not convenient for anyone who travels frequently. Most boarding kennels are not accommodating when it comes to feeding home cooked food and traveling with a dog makes home cooked feeding even more difficult. Most home cooking dog owners have to turn to commercial diets of some type when traveling since it is too inconvenient to home feed on the road. Some dog owners who feed a homemade diet believe that if they include enough variety in their dog’s diet, they do not need to add any supplements to the food. This is simply untrue. A dog’s nutritional needs are different to our own and while incorporating variety into a dog’s diet is important, it will not meet all of a dog’s needs nutritionally. Many dog owners who feed a home cooked diet think that they can make up for any nutritional imbalances in many homemade dog food recipes by throwing a multivitamin into the mix every day. This isn't true. Depending on the meal a dog is eating, certain supplementation must be made and others left out. Adding in a “complete” multivitamin does not fix this issue, however, since they are not made to supplement home feeding. While some vitamins and minerals in the supplement for can indeed help improve the nutritional structure of homemade dog foods, most multivitamins for dogs are made to supplement commercial diets which are already considered to be quite well balanced. This means that your dog will still not receive certain vitamins and minerals from his diet that he really needs. Then, there's also a question of bioavailability of these supplements. If for example, when a dog is lacking in calcium, many dog owners believe that they can supplement a meal with cottage cheese or yogurt to add this calcium. However, it makes it very difficult to accurately calculate how much the dog needs and how much you'll provide him through added foods. Many of the nutrients that a dog requires supplementing are needed in higher concentrations than can be provided through ingredients like yogurt or cottage cheese. This means you may not be able to feed your dog enough calcium without added calories. Sometimes supplements are better, and other times – not so. Many people following homemade dog food recipes believe that adding more fruits and vegetables to a dog’s diet is always better because it adds more vitamins and varied nutrition. Unfortunately, dogs are not as omnivorous as some other animals, like cows. This means that they thrive on a diet that is made up of primarily animal protein, and their digestive system is not made to handle large quantities of vegetables. Adding large amounts of vegetables to a dog’s diet will not improve their health, rather it may cause digestive distress. Some fruits and vegetables are good for the dog, but excessive amount may do the opposite. The only difference between brown and white rice is their glycemic index, meaning brown rice may spike the insulin level slightly less than white rice. It's not much healthier. Furthermore, it is much more difficult for a dog’s digestive system to process brown rice than it is to process white rice. Additionally, if adding rice to a dog’s meal to help with tummy trouble, brown rice does not have the same binding qualities as white rice does. Human beings are omnivores. We thrive on a diet that consists of protein, carbohydrates, and fats. These macronutrients are optimized to meet our needs in a well-balanced meal. Dogs, however, are carnivorous scavengers depending on primarily animal protein, but able to process small quantities of processed grain, fruits, and vegetables. The ratios of these macronutrients required by dogs are much different to the macronutrients required by humans, however, because dogs are not omnivores.